The Labour minority-led Midlothian Council has appointed Derek Milligan as its new leader. Labour's Jim Muirhead was elected as depute council leader at the first meeting of the new council earlier. Adam Montgomery was elected as the new Provost of Midlothian and Margot Russell as Depute Provost. Midlothian Council said it had not appointed cabinet roles. The previous administration had been run by the SNP, with the help of an independent. The Conservatives have five seats and the SNP six on Midlothian Council. What about the other councils? 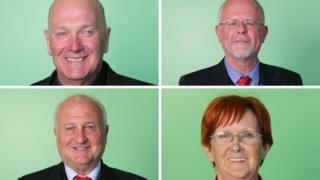 Aberdeen Council - Labour suspended nine councillors after they agreed a coalition deal with the Conservatives. Aberdeenshire Council - A coalition of Conservative, Liberal Democrats and independent councillors will run the council. Angus Council - Conservatives, Independents and Liberal Democrats form administration. Clackmannanshire - The first meeting of the new council could not agree an administration. They will meet again on 1 June. Dumfries and Galloway Council - A coalition between Labour and the SNP has taken control, meaning the Conservative group, which won most seats, is kept out of the administration. Dundee City Council - SNP to form administration with Independent. East Renfrewshire Council - The SNP and Labour are set to run the council despite the Conservatives winning the most seats. Edinburgh Council - No agreement reached. A new administration will not now be formed for at least another week. Fife Council - Joint leadership, with power shared equally between SNP and Labour. Glasgow - The SNP has formed a minority administration, ending almost 40 years of Labour dominance. Highland Council - 28 independents along with 10 Lib Dems and three Labour have formed an administration, keeping out the SNP and Tories. Moray Council - The Conservative group of eight councillors is to join forces with six of the independent members. North Ayrshire Council - Labour will continue to run the council despite a surge from the Scottish Conservatives in the local elections. The SNP have the same number of seats as Labour. North Lanarkshire Council - Labour have formed a minority administration. There will be no formal coalition agreement with the Tories. Perth and Kinross Council - A Conservative-led coalition with the Lib Dems and Independents. Renfrewshire Council - will operate as an SNP minority administration. South Ayrshire Council - A coalition of SNP, Labour and Independent councillors has been formed to run the council. Scottish Borders - A new Conservative-independent coalition has taken formal control. It was previously an SNP/Lib Dem/independent administration. South Lanarkshire Council - Labour members abstained in a vote on forming an alliance with the Tories. The SNP took control of the council, with a minority administration. They are seven seats short of a majority but the other parties could agree to work together. West Dunbartonshire Council - It will be an SNP-Independent administration. The 10 SNP councillors have joined with one of the two independents to form an administration. West Lothian Council - No deal agreed after Scottish Labour's ruling body told councillors not to enter a coalition with the Conservatives. They will meet again on Thursday 25 May. Western Isles, Orkney and Shetland - All administrations dominated by independents.